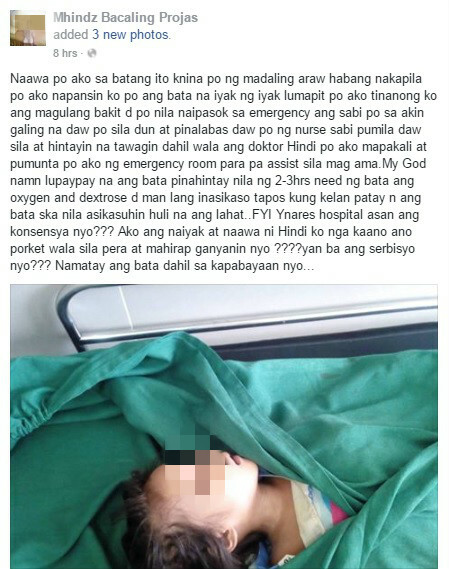 MANILA, Philippines - A netizen on Saturday, July 30 has decided to share awful experience at Casimiro Ynares Sr. Memorial Hospital in Rodriguez, Rizal after a young girl died due to alleged mistreatment of her emergency situation. Child died in a hospital after the nurse told her family to fall in line during an emergency situation. In a Facebook post of Mhindz Bacaling Projas, she has learned that a nurse of Ynares Hospital told the victim's family to fall in line outside the emergency room while waiting for the doctor to arrive. "Naawa po ako sa batang ito na namatay sa Ynarez na Hindi po inasikaso ng mga doktor at nurse sobrang awa po ako sa pamilya NYA walang wala po sila pera taga Macabud daw po sila need nila emergency kaso ang nangyari sinabihan ng nurse na need nila hintayin ang doktor sa labas at pumila kasi wala pa daw doktor," Projas shared. To help the family, Projas went to the emergency room to seek for urgent assistance. On that point, the young girl, who was in dire need of oxygen and dextrose due to dehydration caused by extreme diarrhea has already waited for about 2-3 hours before the hospital attended her emergency case. What happened next was too late for the little girl. "My God namn yung bata lupaypay na at need n i dextrose kasi suka tae sya nagalit ako at pumasok sa loob ng emergency tapos ska nila inasikaso ang bata pero huli na ang lahat namatay na ang bata," she added. The emergency room or department was designed to attend patient's initial treatment even without prior appointment. Whatever your status in life, the emergency room staff should have a super-fast attention and assure that the sickest people get to see the doctor first. Netizens got furious on the said incident and have expressed feeling of anger to the hospital. As of press time, the hospital is yet to release statement on the heartbreaking loss of their patient.